The excellent Fandango Movies app for iPad and iPhone has been updated this week, to Version 5.5.1. The nicest new feature for the iPad version is the addition of filters. We can now filter movies by genre and age ratings. That’s quite handy for finding the right movie quickly. The headline feature of the update – a new ‘Spotlight’ section – is iPhone only for now. It looks very good on my iPhone 4S – but I think it will look even better when it (hopefully) comes to the iPad in a future update. • Passbook ticket has been enhanced for easier scanning! 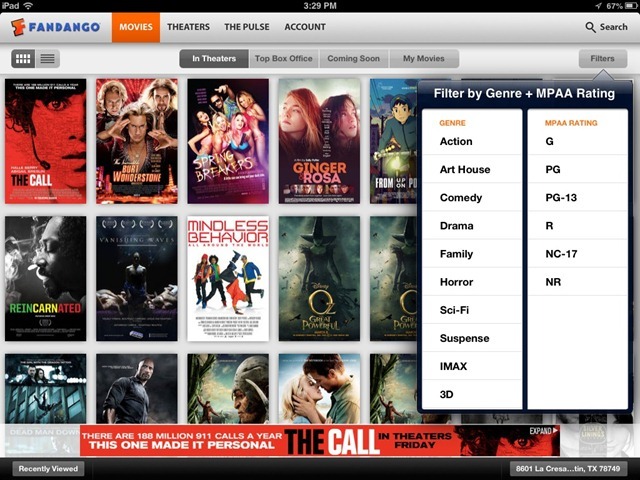 Fandango is a must-have app for movie fans – and was one of our picks in our list of the Best iPad Apps of 2012.